stickboybike: Flat bar Pista update. Bike update. I'm getting more miles lately on the Pista than the T-Cube. The roads are crap and simplicity is sometimes more fun than an expensive Italian bike...sorry T-Cube. Hello Pista! Upgrades continue. 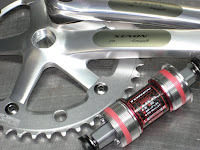 I purchased a crank from Chaz at the Bicycle Stable, one of my dealers. Visit him for all things related to Bianchi. 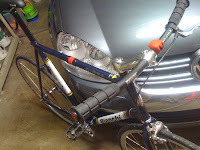 In addition to the crank, I snagged a JIS BB to along with it from Pro Cycling. Just a tad of carbon stink, even on a fun bike. 170mm is the stock length, so I replaced it with the same.